Update - Well the day finally arrived and what a setting Mandy had for her leg of the event - it looks like Mandy was also one of the very few that have completed her leg of the whole event in the dry - certainly on her day, take it from those who watched in Puddletown, Dorchester & Weymouth where it was certainly anything but dry. We are hoping that Mandy will give a full report of the day but in the meantime if you have not yet watched Mandy in action with the Torch click here to see her performance - Excellent!! We are proud to report that Mandy Forbes has been selected as a Torch Bearer for the forthcoming Olympics. The London 2012 web site states that 8,000 inspirational people will carry the Olympic Flame as it journeys across the UK. Nominated by someone they know, it will be their moment to shine, inspiring millions of people watching in their community, in the UK and worldwide. 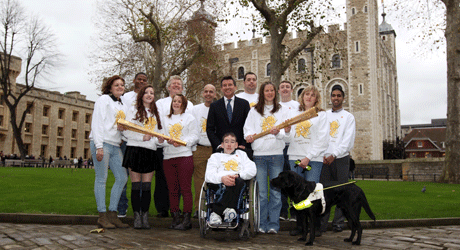 The London 2012 Organising Committee nominations process for Torchbearers ran from May to June 2011 and selection panels were held around the UK in the autumn. Olympic Torch Relay Presenting Partners Coca-Cola, Lloyds TSB and Samsung also held their own nomination campaigns. Tens of thousands of nominations were made; after a careful selection process over 7,300 inspiring Torchbearers have now been confirmed. The remaining Torchbearers will be confirmed over the coming months. Mandy Said about her selection "I thought I was lucky to get through the first round but then when they said I had made it through to the last 8000 from tens of thousands I was amazed, proud and very humbled to think that others thought so highly of what I do. Security checks had to be made and I finally got the red light last Friday,16/03/12 and sworn to not say anything till Monday gone when they put it in the papers. I will be running in IWERNE MINSTER on THURSDAY 12th JULY 2012 around 10.27ish in the morning. There are only three runners in Iwerne Minster each running 300metres.The torch starts in Salisbury that day(day 54) at 07.47 hrs and getting eventually to Weymouth at 18.06 hrs where there is to be an evening celebration." If your in the area on the 12th July I am sure Mandy would love to see you cheer her on. Have a Great proud Day Mandy!